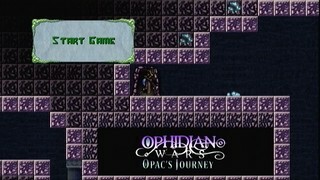 Released in 2010, Ophidian Wars: Opac's Journey is an Xbox Live Indie Game metroidvania. Opac's gotta run, jump, climb, dash, and otherwise scale and traverse large levels to find new upgrades and make his way out of the cave he's trapped in. The game has no enemies, opting instead for puzzlish level layouts. Best time with deaths: 0:10:51.11 by Jess 'JTB' Blouch on 2012-08-25. Thanks to the SDA community and staff for the great site and technical support. The biggest time saver is to skip the dash ability, but to do so I need to collect 26 roots to upgrade the glide and wall grab abilities to clear dash jumps. I use deaths to avoid backtracking. It is possible to skip the checkpoint crystal text box with good timing of the jump button. Skipping the text saves real time; however, I strongly suspect the game pauses the in-game timer when text boxes or menus are activated, including respawns. If I mistime the skip, Opac jumps, which can waste in-game time, so I don't stress about clearing the text quickly. Opac's normal jump height is fixed, but by gliding immediately after jumping, Opac's jump height is increased. This is necessary for some shortcuts and for economizing jumps. The glide jump-height boost stacks with the double jump. The game is very particular about fitting Opac through one block wide vertical gaps. The biggest run breaker is an angled jump through a single block gap. For this run, I pulled this jump off on my second attempt, which was very good. Notable mistakes include a botched jump before the first wall climb (~2 sec), an early jump after upgrading glide that almost leads to death (~1 sec), and missing the first two double jumps (~2 sec).